Hakonen system, Lonetrek region. On the 13th of December at 18:45 EVE Standard Time, Imperium forces clashed with Project.Mayhem. [16-13] and their allies in the system. Another Circle-Of-Two [CO2] tower was set to exit reinforced mode around 18:30 EVE Standard Time. With such a convenient timer, both Project.Mayhem. and Circle-Of-Two were expected to form with maximum numbers in their fleets. However, Project.Mayhem. received intelligence that Circle-Of-Two had asked RAZOR Alliance [RAZOR] for reinforcements. In order to even the field, The Afterlife. [D3ATH] were contacted to give aid. Circle-Of-Two formed a 200 pilot Machariel battleship fleet with a capital squadron set in reserve. The force made it to the Hakonen system, setting up on the Nalvula gate after chasing The Afterlife. Cerberus heavy assault cruiser fleet, estimated at 50 pilots, around the system, though the nimble cruisers were able to easily outrun the slower battleships. Project.Mayhem. had by this point formed its fleet, an 80 pilot Machariel fleet with 4 triage Archon carriers in support. The force entered the system through the Taisy gate. Seeing the larger Circle-Of-Two fleet already set up on the Nalvula gate, the decision was made to engage regardless. Carriers and logistics cruisers warped in range of the gate as the main battleship wing landed on the gate itself. The Circle-Of-Two fleet didn’t waste time and warped on top of the Project.Mayhem. force, starting the engagement. The fight turned into a brutal fire exchange as 800mm auto-cannons blasted round after round into the opposing ranks of Machariels. Armor plates shattered, internal segments torn to pieces as battleship hulls sustained critical damage on both sides and simply caved in to the relentless barrages, exploding in great violence. The Project.Mayhem. fleet first attempted to annihilate the enemies Guardian logistics cruisers before turning its attention to the battleships themselves, prompting a short and somewhat even trade off between the two sides, as logistics wings and triage carriers could not cope with the overwhelming damage which each side projected on the other. However as they were unable to hold but trading evenly, the Project.Mayhem. fleet was in a precarious position. Continuing the fire exchange as it was would lead to the fleet’s eventual destruction, as the damage output dwindled with each volley. Thus dreadnoughts were brought to the field to bolster the damage output of the fleet. As the behemoths jumped to the field and entered their siege cycles, spitting their enormous payload at the suddenly dwarfed battleships, Circle-Of-Two retaliated. Quickly, a dreadnought squadron of its own was brought to the fight, its first targets were the triage carriers of the Project.Mayhem. fleet. With the combined firepower of the battleships and dreadnoughts on the field, the carriers could do little to resist the inferno poured on top of them. Armor plates were stripped, hull ravaged by a hail of 800mm shells and enormous blasts of super heated plasma, punching holes through the ships’ structure. In rapid succession the triage carriers simply melted, explosions engulfing their bodies as critical systems failed, leaving only a giant carcass of twisted metal surrounded by a cloud of debris. As this was going on, the Project.Mayhem. side did not watch idly by but attempted to relieve the pressure from its triage carrier support, targeting the dreadnoughts themselves. Several of the behemoths were felled, ripped apart by artillery fire and capital armaments but alas it was not enough. At the same time, the Razor Alliance reinforcements, an estimated 90 pilots Cerberus fleet, entered the fray. The fleet attempted to engage The Afterlife. Cerberus force which had been hanging around the periphery of the engagement, letting loose flights of missiles at the Circle-Of-Two fleet. The two Cerberus fleets quickly exchanged fire, missiles darting between the two formations as they slammed with great violence into the small hulls. While a few heavy assault cruisers on both sides caved in to the barrages, their shields failing and leaving only a thin armor layer to absorb the damage, the fight itself proved to be merely a side show to the main conflict unfolding on the gate itself. With their triage carrier support gone, the Project.Mayhem. Machariels could not even offer minimal resistance to the Circle-Of-Two fleet. Ship after ship was destroyed as the dreadnoughts for both sides continued to engage each other. However for the Project.Mayhem. fleet commanders the outcome was clear, and so the decision needed to be made. A call was made to de-aggress and retreat as the last few dreadnoughts left for Project.Mayhem. were eliminated. As the fleet attempted to leave more reinforcements for Circle-Of-Two arrived in the form of an Imperium Augoror Navy Issue cruiser fleet of indeterminate size. This force helped to clear the last of the Project.Mayhem. ships who were caught by the Circle-Of-Two fleet as the remnants of the Project.Mayhem. fleet retreated. With the field secured and their tower safe, Circle-Of-Two forces and their allies managed to win both the objective and the battle before safely extracting back to their staging system, ending large scale hostilities in the system. All told the battle lasted 30 minutes with Time Dilation being a noticeable factor, swaying between 30%-70% at times. The system is believed to have hosted nearly 500 pilots by the end of the fighting. Project.Mayhem. 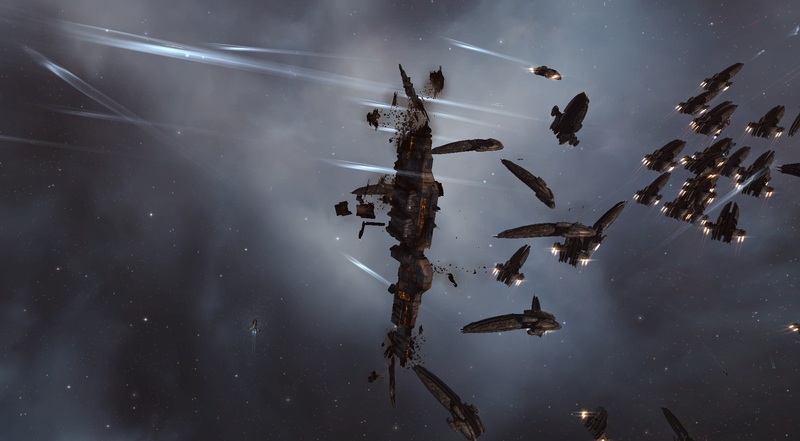 and its allies lost 34 ships including 4 carriers, 5 dreadnoughts, 14 battleships and 3 heavy assault cruisers for a total of 46.28 billion ISK damage. Imperium forces suffered 23 losses including 4 dreadnoughts, 5 battleships and 2 heavy assault cruisers for a total of 14.96 billion ISK. CFC being bad again, 4:1 odds and still batphoning to send help. Quantity has a quality all of it’s own. Only becasue you think it’s important to win with even numbers or better yet outnumbered. If all you care about is winning what doies it matter how you acheive it? Getting reinforcements from your own coalition is not batphoning dummy. If you wrote a book I would donate money to its kickstarter. Imperium style – blob’em all!!! More fresh meat, more capsulers, heh, U can not do anything against blob. So, in the future, all fleets will be defeated and all tower will be taking by Imperium. Or PL/NC will help 16-13, but I do not think so. Will see on further battles. Nothing wrong with a good blob – it’s an effective tactic that wins fights and winning fights is really the name of the game. Someone take the thesaurus away from Sali, his verbal diarrhea is getting all over the place. Aw, this was a really nice post. In idea I wish to put in writing like this moreover – taking time and actual effort to make an excellent article… but what can I say… I procrastinate alot and by no means appear to get one thing done. to create this particular submit incredible. Great process!